Weeds compete with plants for moisture, light and nutrients during the fallow or interim period between crops and during the growing season. Weeds also serve as alternative hosts for various insects and disease pests. It is important to learn which weeds will grow rapidly and greatly impact the potential planned crop yield. To be able to assess the impact that weeds can have in crops the farmer must have a detailed assessment of the types of weeds present in a particular cropping system. This can be achieved by implementing an integrated pest and weed control programme. Scouting is defined as a process of exploring to gain information. In this instance the information gained concerning the specific weed problems on your farm will enable a relevant weed control programme to be developed and implemented. It is highly recommended that farmers and agents or consultants buy a copy of Common Weeds of Crops and Gardens the 2nd Edition available from the ARC Crops Institute. (ISBN- 13 978-1-86849-399-9). Each weed type is well documented with photos of the seeds, early seed growth and mature plants and is an essential tool to identifying seeds so that clear identification and communication can be made between the farmer to the suppliers of herbicides and various mixes regarding the extent of the problem and the relevant chemical control of the specific weed problem in your crops. Efficient weed scouting requires a thorough knowledge of weed and crop biology, weed identification and growth habits, correct sampling methods and an economic impact evaluation of the infestation levels in a particular crop that will justify the expense of mechanical or chemical control. Scouting for pests or weeds is usually carried out by walking through the lands in a zigzag or M pattern and assessing and counting the various weeds found in a square metre steel square placed on the ground, for example, every 50 or 100 metres. The idea is to create a random but representative picture of the intensity and prevalence of the problem weeds. 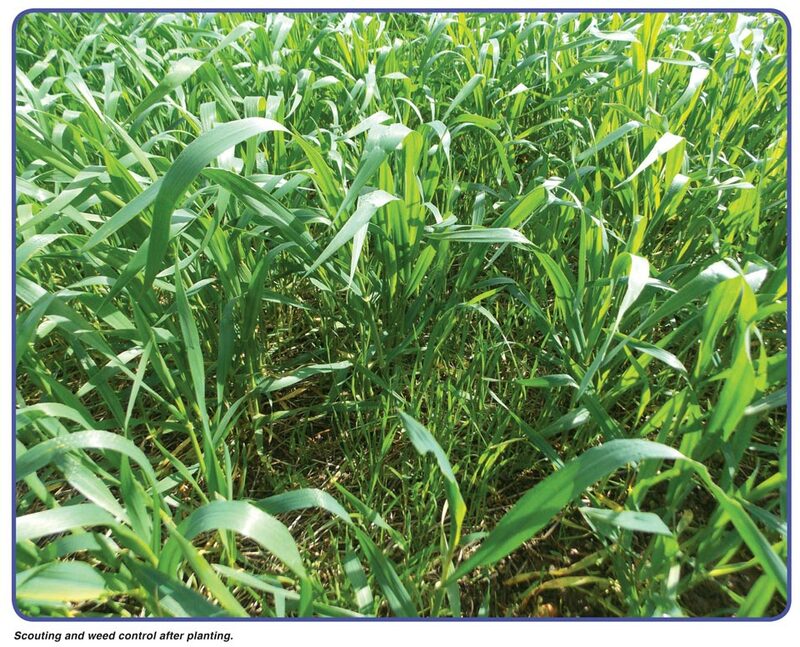 The scouting and monitoring should take place in the period between crops prior to planting and in maize production at the 4th to 5th leaf stage at a stage when annual broadleaf and grass weeds are less than 38 mm tall. If maps of the lands can be generated then the actual location of the test areas can be marked either by visual estimation or use of a GPS system for future reference. Remember that weed infestations at the edge of a land might not represent the population of weeds found within the land. Sample carefully and objectively and take the size of the land into consideration when deciding on the number of points where measurements are taken. A rule of thumb would be to do each 25 hectares separately. Scattered: Weeds are present but very few plants in the lands. Slight: Weeds scattered throughout the land. An average of no more than one weed plant per metre of row. Economic loss unlikely but possible in certain areas. Moderate: Fairly uniform concentration of weeds across the land with average concentrations of no more than one plant per 30 cm. Economic loss likely unless control measures taken. Severe: More than one weed plant per 30 cm's of row for broadleaf weeds, three weed plants per 30 cm’s for grasses or large areas of heavy infestations. Economic loss certain unless the weeds are controlled. 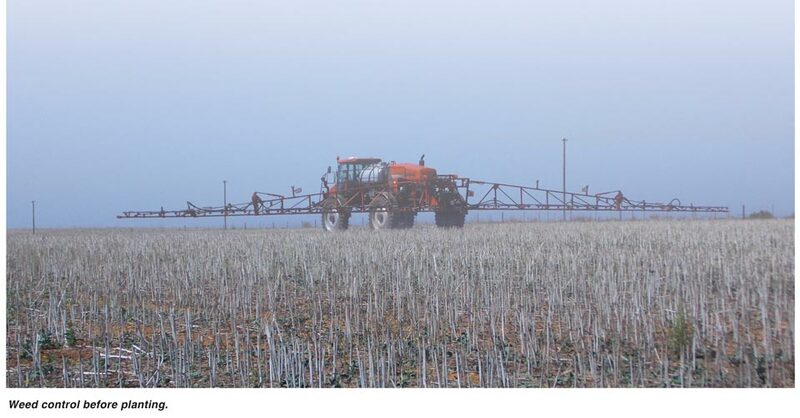 There are so many spray programmes available for genetically modified and normal crops that can be applied prior to planting, at planting and after planting. Keep in mind that the correct spray procedures must also be used in a no-till system or a conventional crop productionsystem. Always consult your herbicide supplier or agent before undertaking any programme envisaged. It is important to be able to control a potentially bad infection either prior to plant or after planting timeously to prevent major economic loss. Although it is possible to do ad hoc assessments of weed problems for control from year to year a written analysis over a few seasons will be of value. Keep records of every land on your farm and the different crops grown and record the weed assessment data so that you and your herbicide supplier can identify persistent weed problems and most importantly pick up as soon as possible any weeds types that are becoming resistant to a particular chemical programme. The records should at least have the following data noted including, assessment period being pre or post planting, land location, cropping history, crop yields, pesticide use, herbicides used, soil type, soil test records, major pest and weed problems as well as the success rating of particular herbicides used. As the use of herbicides is an expensive exercise when the whole costs of each spraying operation are taken into account it is important to accurately assess the problem in time. The increasing problem of resistance to herbicides must be kept in mind. Study the world trend by farmers to going back to mechanical weed control coupled with the optimum application of chemicals in order to reduce the overall costs of weed control but within the context of realising profitable yields on your farm.